The Food Security Factor: Stability, Governance, and Development Choices | The Hollings Center for International Dialogue | The Hollings Center for International Dialogue is a non-profit, non-governmental organization dedicated to fostering dialogue between the United States and countries with predominantly Muslim populations in the Middle East, North Africa, South Asia, Eurasia and Europe. 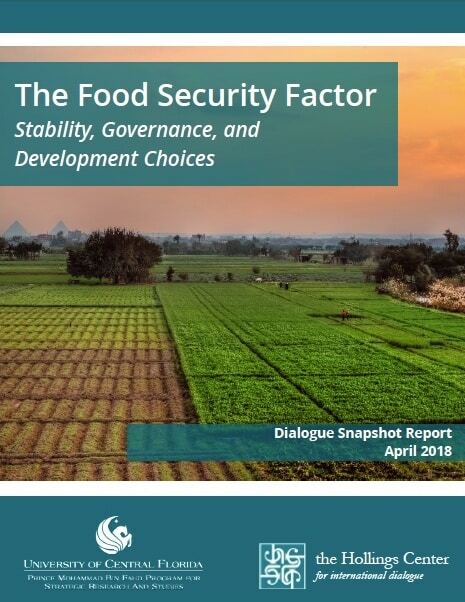 Food security in the Middle East and North Africa (MENA) region is viewed as one contributing factor in catalyzing conflicts in the region as well as perpetuating multiple humanitarian crises. The MENA region is the largest importer of food in the world, accounting for nearly 1/3rd of global cereal imports. Rising prices in staple foods since 2009, coupled with rising turmoil since the Arab Spring in 2011, growing water scarcity, and poorly developed environmental and agricultural policies by regional governments have all contributed to the growing food crisis. The region contains some of the highest risk countries for food insecurity, such as Yemen, in which severe water scarcity and prolonged civil conflict have combined to make Yemen the 11th least food secure country in the world. Countries like Iraq, Syria and Egypt used to be large producers of grains, but due to instability and decades of mismanaged agricultural, they have become dependent on grain imports. Growing food insecurity has led wealthier countries like Saudi Arabia to lease land in different countries to produce food, including land from some of the world’s most food insecure countries such as Ethiopia. Countries such as Turkey, Lebanon and Jordan also face changing food security needs as their populations grow in part due to large influxes of refugees. The challenges in this region foster many questions. How will the region meet the growing demand for food? What are the implications of the current political environment in the region on food security? What type of food security planning is needed in this environment? How can food security policies be implemented? What type of economic and environmental policies can support food security management? Food Security is politics. 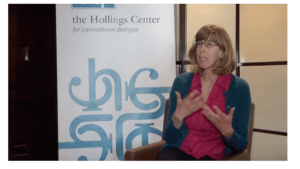 Wavering political will, corruption, and poorly developed bureaucratic systems create the largest impediments to addressing food security challenges. Addressing these political barriers will be the key to creating more resilient food systems. Many deployable technical solutions to food security challenges already exist. Better crop management technologies, water usage strategies, and conservation techniques can be readily utilized today, some with minimal cost. However, the food security challenge is not just a technical problem. The issue generates many other sensitivities that require addressing at the same time as these technical solutions. National self-sufficiencies in food will no longer serve the needs of countries in the MENA region. Better developed local and regional approaches can replace outdated policies. One possible way to do this is promote trade liberalization. At the same time, actors need cognizance of national fears of external dependence and the risks such dependence on outside sources of food entails. Emphasis should shift from caloric production to better nutrition. Health components should be considered in the adoption of new strategies.